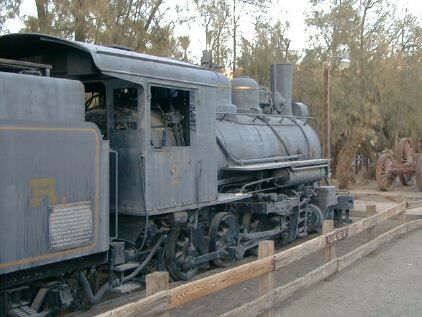 The Death Valley Railroad was incorporated January 1914 to build a line for the Tonopah and Tidewater Railroad at Death Valley Junction to New Ryan in Death Valley. 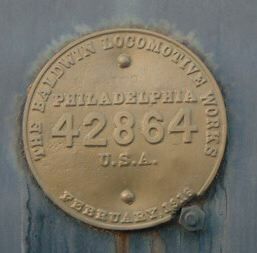 The line was completed by December 1914 and operations started with two Baldwin 2-8-0 locomotives built in June, 1914. DVRR #2 was the second of two engines of the Death Valley Narrow-Gauge Railroad which transported borax ore from the mines at Ryan to the processing plant at Death Valley Junction between 1916 and 1927, The sixty ton oil-burning locomotive was sent to the potash mines near Carlsbad, New Mexico in 1931 where it hauled ore from the mine to the refinery for the next 25 years. 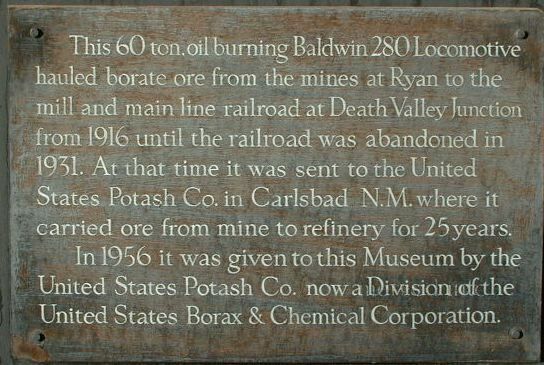 U.S. Potash returned the historic engine to Death Valley in 1956 for display at the Borax Museum. This engine was manufactured by the Baldwin Locomotive Works of Philadelphia, Pennsylvania in February 1916. A passenger motor car built by J.G. 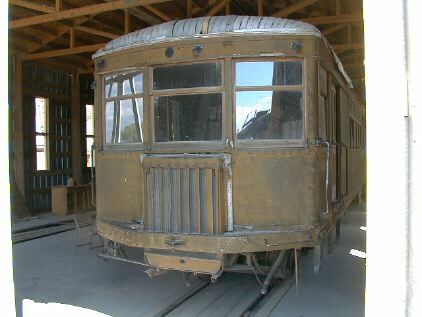 Brill Company in November 1928 and numbered 5 was put in service to haul passengers between Death Valley Junction and New Ryan until the line was abandoned in December 1931. The locomotives and motor car were moved the the U.S. Potash Company in Carlsbad, New Mexico where the car operated until retired in 1956. 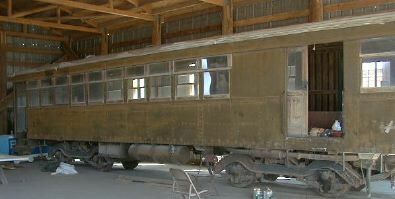 In 1967, the car was donated to the Laws Railroad Museum and moved by rail and truck to Laws, arriving November 27, 1967. DVRR #5 was use for both passenger and freight service. The front part of the car is the baggage, driver's and engine compartment. 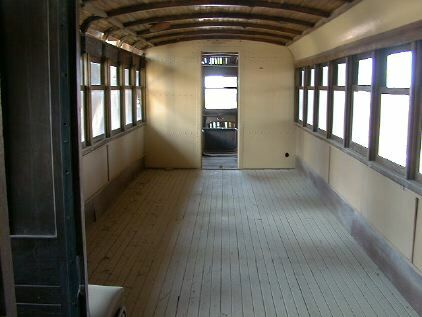 The rear part contained seats at one time. Efforts are underway to restore the car. All windows were rebuilt and replaced by Mr. Bi Byrne in 1979 and a new roof and paint job was done by the California Employees Training Association. Since then the car has been moved from outdoor display to a newly built carbarn. Due to the rebuilt roof and new windows, the interior of the car is still in fairly good shape however it is clear that the roof needs more work due to degradation over 20 years in the weather. 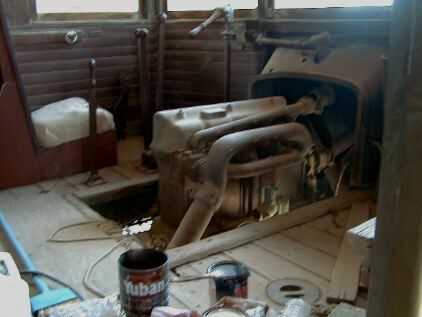 The restorers will have to locate some seats if they make good on their plan to return this car to operational status. The car is powered by a 4 cylinder gasoline motor connected to a conventional clutch and manual transmission. The drive shaft leaves the transmission and goes to a gearhead in the front truck. Another shaft leaves the rear of the gearhead and appears to drive an air compressor. 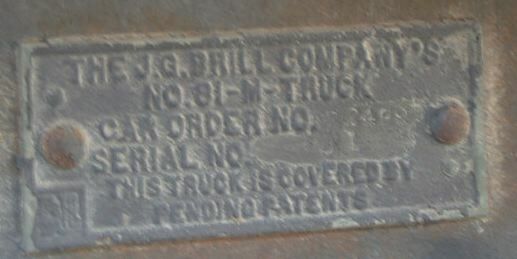 The builder's plate affixed to the left side of the front truck indicates that the car was manufactured by Brill.